“I talk to him all the time, and he checks in on me all the time.” — Meghan McCain on how former Vice President Joe Biden has been supportive during Sen. John McCain’s illness. “I'm not in a position to either understand fully or talk about what happened in Helsinki.” -- Director of National Intelligence Daniel Coats when asked what he knew about the Trump-Putin summit. 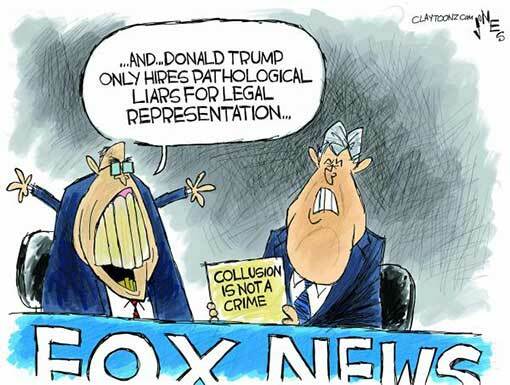 “Hannity is a propagandist for profit, peddling lies every night. He says he’s just a talk show host, not a journalist. But he’s injecting poison into the nation’s political bloodstream warping public attitudes about the press. I’m confident in the long run the truth will prevail.” -- CNN’s Jim Acosta hitting back at Fox News host Sean Hannity for saying that attendees at President Trump’s rally were right for heckling the CNN correspondent. “I mean seriously, on the tweets, is anybody even paying attention anymore? I mean there’s so many of them, they conflict each other so much. Nobody pays attention around here.” — Sen. Bob Corker (R-TN), on Trump’s use of Twitter. “It won’t be easy. We’re going to have to fight uphill. Me? I’m going up that hill. And I hope you are, too. And I hope that you’ll reach your hand out and bring someone else along for the climb.” -- At Sen. Elizabeth Warren (D-MA) in her keynote address at Netroots Nation, hinting at the possibility that she could run for president in 2020. “I have great respect for the U.K. United Kingdom. Great respect. People call it Britain. They call it Great Britain. They used to call it England, different parts.” — Trump, at a rally in Pennsylvania. “This has never happened before. We’ve had great presidents; we’ve had terrible presidents, Republicans and Democrats; but we’ve never had anything like this — where we have a president who is incapable of telling the truth. — Former White House press secretary Joe Lockhart, in an interview on CNN. “The most bizarre thing I’ve ever been a part of.” — Maine Secretary of State Matthew Dunlap (D), quoted by the Washington Post, on President Trump’s “voter fraud” panel. Californians were baffled on Monday by a series of tweets by Donald J. Trump in which he utterly failed to blame the state’s current wildfires on Hillary Clinton. Carol Foyler, who lives in Monterey, said that Trump’s failure to accuse Hillary Clinton of single-handedly causing the wildfires left her shaken and appalled. The United States trade deficit widened in June and is on track to be the biggest in a decade despite President Trump’s efforts to slash it. President Trump tweeted Sunday morning that his tariffs are “working big time” and made a bizarre claim that the money raised from these new import taxes will go a long way to helping pay down America’s large debt. (Short answer: That’s not what will happen). As Special Counsel Robert Mueller’s investigation into Russian interference in the 2016 election has heated up, so too have Donald Trump’s Twitter fingers. 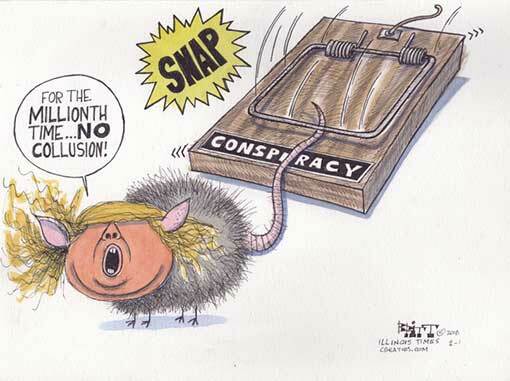 The president is fond of repeating certain disparaging phrases about Mueller’s investigation on the social media platform, repeatedly referring to it as a “hoax” and a “scam.” But his favorite moniker by far is “Witch Hunt”—embellished, in recent weeks, to “Rigged Witch Hunt”—which Trump has used a whopping 84 times this year alone in reference to Mueller’s investigation. It’s not clear yet how Gates’s testimony will affect the outcome of the trial, in which Manafort is charged with tax evasion, bank fraud, and failing to disclose foreign bank accounts. But his time on the witness stand provided an invaluable public lesson in how tax evasion, money laundering, and political corruption work. A review of nearly 2,000 documents from President Donald Trump’s now-defunct Presidential Advisory Commission on Election Integrity contradicts claims of widespread voter fraud, Maine’s secretary of state said Friday. 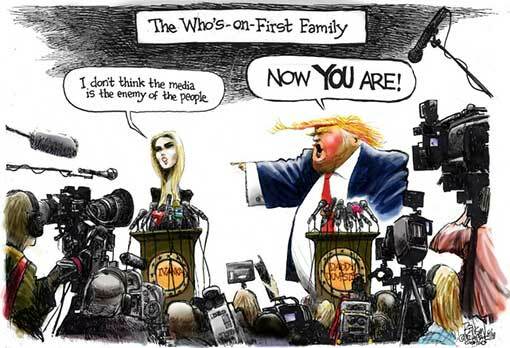 Presidential historian Jon Meacham on Friday lashed out at President Trump for calling the media an “enemy of the people,” saying it’s a “totalitarian” strategy. Meacham, while appearing on MSNBC's "Morning Joe," said Trump's frequent targeting of the media will become his legacy. Who’s the real dummy? A man who puts kids in classrooms or one who puts kids in cages? #BeBest -- CNN news anchor Don Lemon. Special counsel Robert Mueller has requested an interview with Russian pop star Emin Agalarov, who helped set up the now infamous 2016 Trump Tower meeting. Through the manipulative efforts of conservative activists, a grossly irresponsible, right-wing media outlet. It’s time to stop pretending otherwise. "Russia, Immigration and Trade War Sticking to Trump" is the headline of a new polling memo for Priorities USA by Garin-Hart-Yang Research Group and Global Strategy Group. Trump’s dealings with Vladimir Putin, his handling of immigration and the separation of children from their families, and the impact of his trade war have stuck with voters in a way nothing else has since the beginning of his presidency. Kamala Harris has been the target of social media misinformation campaigns since she became a U.S. senator. Every month for the last 18 months, her office has discovered on average between three and five fake Facebook profiles pretending to be hers, according to a Harris aide. It’s unclear who creates the pages, which are often designed to mislead American voters about the ambitious Democratic senator’s policies and positions. The aide spoke on the condition of anonymity, like more than a half dozen campaign officials contacted for this story, for fear of attracting unwanted attention from adversaries or scrutiny on the Senate office’s evolving cybersecurity protocols. The Republican National Committee is sending a warning shot to major GOP donors not to play ball with the powerful Koch political network, escalating a fight between President Donald Trump’s allies and the Kochs. The move follows a weekend retreat in Colorado at which Koch network officials criticized the Trump administration, hinted they would work with Democrats, and announced they would not help a Republican candidate in a key 2018 Senate race. Amid the headline-grabbing details about Manafort’s extravagant spending ― the $15,000 ostrich jacket, the thousands of dollars worth of suits, the red flowers in the shape of an “M” ― prosecutors’ narrative about Manafort’s shady financial dealings is going to be difficult to refute. For QAnon believers, special counsel Robert Mueller isn’t really investigating the Trump campaign—he’s actually working with Trump to take down a cabal of deep-state plotters and pedophiles. Soon, QAnon fans believe, Trump will team up with the military to throw top Democrats like Hillary Clinton and Barack Obama into Guantanamo Bay. 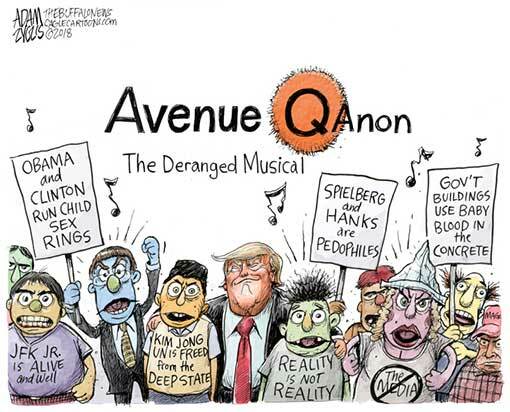 But what QAnon believers actually believe is constantly changing. After taking advantage of the murder of DNC staffer Seth Rich and promoting dangerous ideas like Pizzagate, QAnon supporters have found a new tragedy to exploit: the death of John F. Kennedy Jr., son of the late president. The United States is on pace to add about 2.6 million jobs this year under President Trump’s watch. Yet the bulk of the hiring has occurred in bastions of Democratic voters rather than in the Republican counties that put Trump in the White House. On average for the year-ended this May, 58.5 percent of the job gains were in counties that backed Democrat Hillary Clinton in 2016. Back in 2016, there wasn’t much love lost between Bernie Sanders and EMILY’s List, the Democratic advocacy group that backs pro-abortion-rights female political candidates. The groups two sparred over candidate endorsements (including for Hillary Clinton) and the campaign’s ‘condescending’ comments about Clinton’s campaign, and — last year — over Sanders’ appearance at a women’s conference. Fast forward to now, and the two factions are facing off more and more in the 2018 Democratic primaries. And that’s largely been because Sanders — in races that feature prominent women — has often endorsed a rival male candidate instead. Like an NFL coach reviewing game film, President Trump likes to watch replays of his debate and rally performances. But instead of looking for weaknesses in technique or for places to improve, Trump luxuriates in the moments he believes are evidence of his brilliance. Trump commentates as he watches, according to sources who’ve sat with him and viewed replays on his TiVo, which is pre-loaded with his favorites on the large TV in the private dining room adjoining the Oval Office. When watching replays, Trump will interject commentary, reveling in his most controversial lines. ‘Wait for it. … See what I did there?’ he’ll say. 1. David Atkins: Does Trump Even Understand What He Did Wrong? Even the briefest observation of Donald Trump is adequate to confirm that he is not a man of profound intellect. He certainly possesses his share of social intelligence, a knack for salesmanship and an obsessive drive to dominate and humiliate others stemming from a yawning maw of overlapping insecurities. But in terms of how we traditionally measure intelligence in the modern developed world–the acquisition of knowledge over time and the ability to process, digest and act cogently in response to complex information–Trump probably doesn’t even reach the 50th percentile of Americans. And that is being generous. This basic fact is difficult to keep in mind when assessing his decisions because we have never had a president like this. 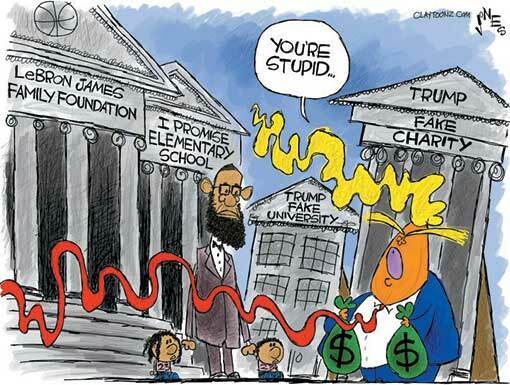 Society tends to dramatically overestimate the talent and intelligence of those fortunate enough to be rich and powerful, but rarely are they as objectively ignorant and lacking in basic competency as Trump. Far too often we look for a schema or strategy behind Trump’s actions, only to discover that his decisions were precipitated by the dumbest of reasons: because he saw a Fox News segment that made him angry, or because he heard that Barack Obama had originated a policy, because some extraneous person mentioned some falsehood to him that he was credulous enough to believe, or because he was openly bribed. This principle has become known as “Trump’s Razor“: when seeking to understand the president’s behavior, look for the stupidest possible reason. I mention all this because while I don’t fully believe it myself, we must at least consider the possibility that Trump’s bizarre behavior with respect to Russian collusion, the Mueller probe, and his obstruction of justice is that he literally does not understand when he committed crimes or what is wrong with what he did. 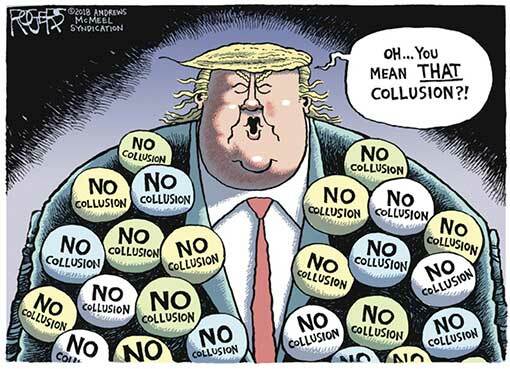 His social intelligence and gut instinct for politics certainly leads him to understand that some aspects of the collusion and obstruction would be politically damaging to him if they fully came out. But it’s entirely possible that at a moral level and, crucially, at a legal one, he simply isn’t smart enough to grasp the enormity of the crimes he and his associates seem to have committed. Trump may lack both the moral compass and the legal wherewithal to even comprehend the magnitude of his crimes and the precariousness of his situation. He certainly understands how politically inconvenient all of this is for him, yet it’s not entirely clear that he grasps why this isn’t a witch hunt, but perhaps the biggest scandal in all of American history. Frankly, confirming the presence on the campaign — at its highest level — of a guy as thick as thieves with the Russians will begin to chip away at Trump’s emphatic denial of any contacts or ties with Russia. 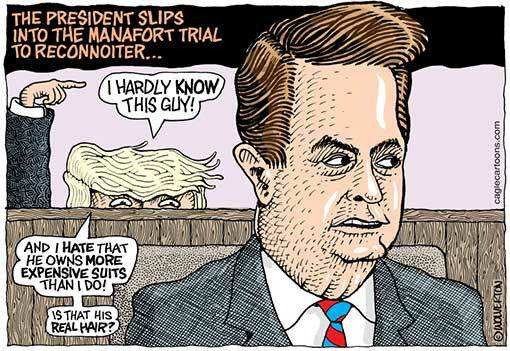 Remember, in July 2016, Manafort was asked by ABC’s George Stephanopoulos, “Are there any ties between Mr. Trump, you or your campaign and Putin and his regime?” Manafort answered, “No, there are not. That’s absurd. And you know, there’s no basis to it.” Except that was patently false. Trump also denied campaign contacts with Russians, as did Reince Priebus, the president’s one-time chief of staff. In February 2017, Priebus declared, “The New York Times put out an article with no direct sources that said that the Trump campaign had constant contacts with Russian spies, basically, you know, some treasonous type of accusations. We have now all kinds of people looking into this. I can assure you and I have been approved to say this — that the top levels of the intelligence community have assured me that that story is not only inaccurate, but it’s grossly overstated and it was wrong. And there’s nothing to it.” Except there were dozens and dozens of contacts, including by Manafort. 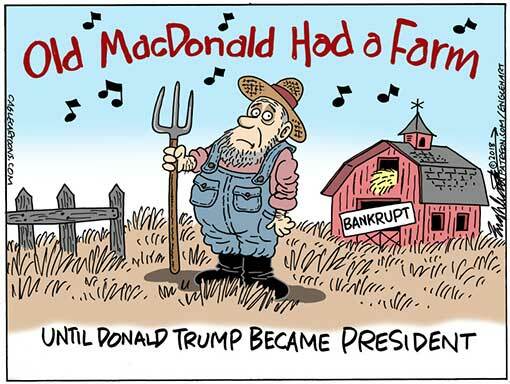 Trump is nowhere near the tradeless world of his factory speech fantasy, but the effects of his trade war are being felt, perhaps most painfully by American farmers, whose industry is already made economically and environmentally precarious by federal meddling. In response to Trump's tariffs on a basket of 800 Chinese goods, China has levied a 25 percent tax on 545 U.S. exports, including agricultural products like rice, beef, pork, and more. Soybean farmers expect a particularly hard hit, as China previously bought fully a third of their product. Maine lobster harvesters are suffering, too, as Chinese buyers turn to Canada, subject to a 7 percent lobster tariff, to avoid 35 to 40 percent taxes on American lobsters. Rather than call a trade truce, the administration has responded with a $12 billion farm bailout. Beyond the gross hypocrisy of Republicans' supermajority support for the plan — they'd be howling objections had a Democratic president proffered this "fix" — this aid package only compounds the original error. It's like responding to a fever by cranking up the air conditioning and pretending nothing's wrong. The bailout might temporarily ease one symptom, but it will only prolong our pain. President Trump on Wednesday got on his Twitter machine and suggested, in a rambling, seven-post tirade, that Attorney General Jeff Sessions "should stop this Rigged Witch Hunt right now." Two years ago, it might have been shocking to see the president ordering his top law enforcement official to stop the government's inquiry into him and his campaign's possible collusion with a hostile foreign power — basically obstructing justice in plain sight. But in this case, it was just another miserable morning in occupied D.C.
What exactly precipitated this latest monarchical meltdown is not clear. ABC News reported that Special Counsel Robert Mueller wants to interview Trump about obstruction of justice, so that could be it. The outburst also coincided with the second day of the trial of international man of griftery and former Trump campaign manager ("for a very short time"!) Paul Manafort. 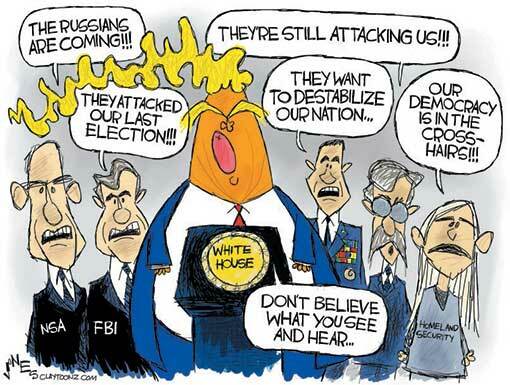 The outburst brought with it fresh fears that Trump will conduct some kind of Morning Massacre, firing Sessions, Mueller, and Deputy Attorney General Rod Rosenstein in one fell swoop. But even if he did that, it wouldn't matter. We will, one way or another, finally know what Mueller knows, and no amount of presidential theatrics can change that. Yesterday, the Trump administration unveiled plans to allow insurers to skim healthy customers out of the insurance pool by offering skimpy plans that last for up to three years. The legally dubious maneuver is the crowning touch on the administration’s persistent efforts to undermine the Affordable Care Act. Conservative intellectuals are justifiably ecstatic. “Wednesday’s rule came to be because dedicated people within the Trump administration worked hard to push federal policy in a libertarian direction,” exults Cato Institute scholar and onetime author of the “Anti-Universal Coverage Club Manifesto” Michael Cannon. Indeed, Trump’s attacks on Obamacare, taken together as a sum, provide a fair picture of the American right’s unique, social Darwinist philosophy of health-care policy. Many people are either too poor or too sick to afford access to medical care. In every democracy in the world save the United States, a broad social consensus accepts the need to subsidize care for those people. This includes the conservative parties in those countries. Among right-of-center parties in the developed world, only the Republicans are so committed to anti-government dogma as to oppose measures to subsidize medical care for those who can’t afford it themselves. But whenever Democrats have attempted to expand access to health care, Republican leaders have generally declined to present themselves as principled opponents of universal health care. Instead, they have promised they could accomplish the same goal in a better, cheaper fashion, without any of the painful trade-offs in the existing Democratic-authored proposals. No such plan ever emerged, in part because Obamacare was the most market-friendly way to accomplish the bare minimum objectives of any humanitarian health-care reform. The only space to Obamacare’s right involved punishing the poor and sick with medical and financial deprivation. The Republican Party knows that it won’t win many elections by campaigning on its governing agenda. After winning unified control of the federal government in 2016, the GOP Congress prioritized two legislative goals: slashing federal health-care spending by roughly $1 trillion, and cutting taxes on the wealthy and corporations by even more than that. But one would hardly know that from the GOP’s paid messaging in 2018. In their campaign ads, Republican candidates are avoiding all mention of their party’s attempts to gut Medicaid and repeal the Affordable Care Act — while giving short shrift to Donald Trump’s signature tax cuts. As of May, only one-third of the ads arguing that Republicans should retain control of Congress mentioned the cut, the only major legislation that the current Republican Congress has passed. Instead, the GOP has opted to campaign against “open borders” (which no Democratic elected official supports), for loyalty to Donald Trump, and, above all, in opposition to Nancy Pelosi — and the godless urbanism, rootless cosmopolitanism, and crytpo-communist femi-nazism she (apparently) represents. What can’t be ignored is presidential behavior that might best be described as incitement. Maybe Trump supposes that the worst he’s doing is inciting the people who come to his rallies to give reporters like CNN’s Jim Acosta the finger. And maybe he thinks that most journalists, with their relentless hostility to his personality and policies, richly deserve public scorn. Should that happen — when that happens — and journalists are dead because some nut thinks he’s doing the president’s bidding against the fifth column that is the media, what will Trump’s supporters say? No, the president is not coyly urging his supporters to murder reporters, like Henry II trying to rid himself of a turbulent priest. But neither is he the child who played with a loaded gun and knew not what he did. Donald Trump’s more sophisticated defenders have long since mastered the art of pretending that the only thing that matters with his presidency is what it does, not what he says. But not all of the president’s defenders are quite as sophisticated. Some of them didn’t get the memo about taking Trump seriously but not literally. 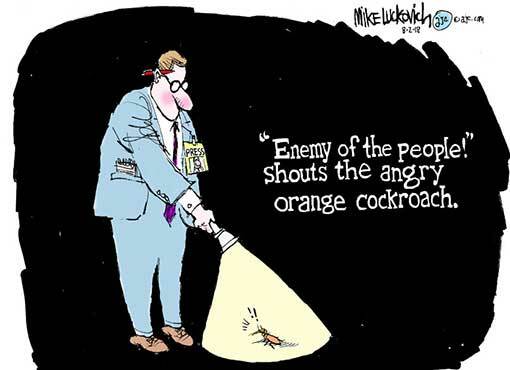 A few hear the phrase “enemy of the people” and are prepared to take the words to their logical conclusion. College courses are devoted to presidential rhetoric. Generations of schoolchildren were once required to memorize the Gettysburg Address; the words of Lincoln's second inaugural are inscribed on his memorial. You don't have to be a historian — just a reasonably alert American — to recognize how powerful a president's words have been throughout history. "And so, my fellow Americans: ask not what your country can do for you—ask what you can do for your country." "I can hear you! I can hear you! The rest of the world hears you! And the people — and the people who knocked these buildings down will hear all of us soon!" This summer, forests are bursting into flame all over the world. More than 50 wildfires have scorched a shocked Sweden — some of them north of the Arctic Circle — as temperatures have soared into the 90s amid withering drought. In normally chilly Oslo, the mercury climbed past 86 degrees for 16 consecutive days. The Brits have been gobsmacked by 95-degree weather; it hit 98 in Montreal; and in Japan, 22,000 people were hospitalized when temperatures climbed to a record 106. In Arizona, Southern California, Pakistan, and India, summer's broiler has been turned up to unbearable levels, past 110 degrees, and people are dying. Heat, drought, and fires of this scale and scope are not normal — or perhaps they now are. 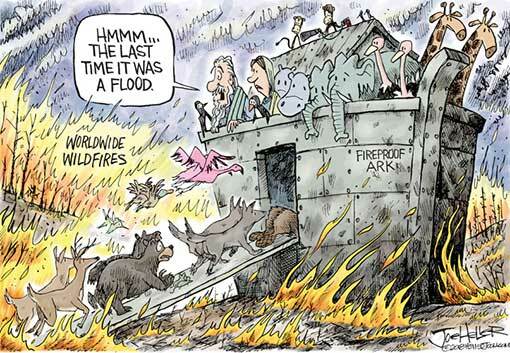 Climate change, says Elena Manaenkova of the World Meteorological Organization, "is not a future scenario. It is happening now." 11. Mindy Finn: Trump has built a pyramid scheme of public fraud. 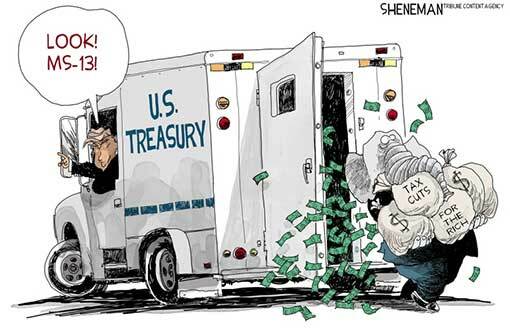 It's a taxpayer-backed cash grab. 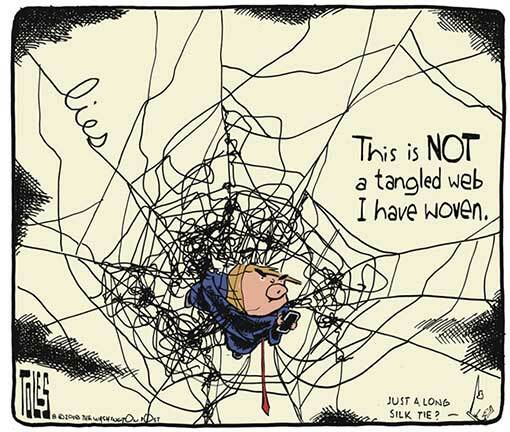 Far from draining the swamp, Trump and his coterie of grifters, fraudsters and co-conspirators have filled it in entirely, dividing the land into personal fiefdoms to exploit. In short, Trump has built a clearly organized machine for largesse and corruption. It’s a pyramid scheme of public fraud, and the president gleefully sits at its top, reaping the rewards and doling out the shares. 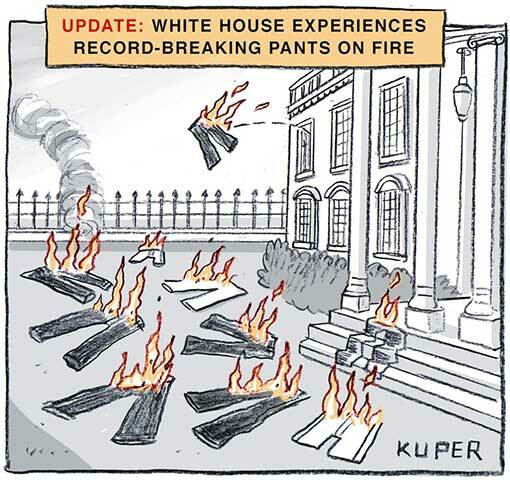 Still, the president and his defenders deny anything is wrong. Many throw up their hands and say “Washington has always been this way.” That’s certainly what Trump would have us believe. In truth, this level of corruption is rampant in dictatorships across the globe, but unprecedented here. It’s disturbing to see the president ripping this page from the authoritarian textbook, though entirely in character. All around him he’s traded his blessing of corrupt dealings for a weakening of the agencies which might hold some check on him. Now, as key voters threaten to rebel over his policies, it’s only natural that he’d seek the same bargain with them. 12. Jonathan Chait: Liberals Are the Real Nazis, Says Donald Trump Jr. Actual Nazis Disagree. Anything that inspires Donald Trump Jr. to want to learn more would seem to be laudable. Sadly, Trump Jr. is not proposing that today’s youth should take more history classes. Indeed, he maintains that history classes are filled with lies promoted by liberal academic elites. Instead, he wishes the dreadlocked youth would pay more attention to the revisionist history promoted by D’Souza in his latest film, Death of a Nation. In it, D’Souza continues his long-standing contention that racists and fascists of the far right are actually the true allies of the liberal left. “You see the Nazi platform in the early 1930s … and you look at it compared to like, the DNC platform of today, you’re saying, man, those things are awfully similar,” said Trump Jr. It is bizarre that conservatives are still attempting to surmise, through indirect inquiry, what Nazis would say about politics today when there are actual Nazis who are happy to pick up a tiki torch and tell us. There is no mystery here. The people who proudly lay claim to the legacy of the Confederacy and Nazism are openly enthusiastic about Trump. They are fine with his economic populism, and gaga for his nativism. It’s important to stop and note that there’s nothing necessarily illegal about any of these real estate transactions. But Trump’s nonstop, manic attacks on Mueller’s investigation — and the media — look to me like the behavior of the guilty hearing footsteps and finding no place to hide. Trump’s only alternative is to discredit and whip up a body of hate against those who would expose him for what he is: an amoral liar and self-centered, money-grubbing fraud, with a loyal following that would make any other cult leader jealous. 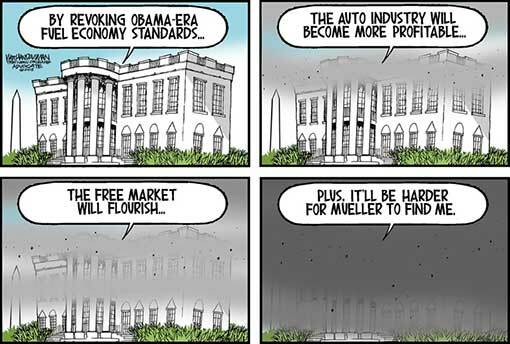 But Mueller, too, has no alternative but to follow the Russian connections and the money and see where they lead. In an alarming report published in the prestigious Proceedings of the National Academy of Sciences, 16 scientists warned that — thanks to a series of dramatic positive-feedback loops they suggest might be significantly underestimated by the U.N.’s Intergovernmental Panel on Climate Change, which effectively establishes the boundaries of acceptable discourse on global warming — the planet may already be heading down a far more harrowing warming path than most scientists, and certainly most nonscientists, understand. In particular, the team of 16 scientists suggested that, while the Paris climate accords committed the world to the goal of stabilizing global warming below two degrees Celsius, in fact there may not be a natural planetary equilibrium there — and so even if we managed to hit the emissions targets consistent with only two degrees of warming, a series of accelerating climate-system feedback loops would be triggered anyway, bringing us quickly past three and even four degrees Celsius. They called this possibility the “Hothouse Earth” pathway, and they outlined an even darker, worst-case scenario in which feedback loops brought us up to six or even seven degrees. Despite the strong economy, Democrats have consistently led in congressional generic ballot polls for more than a year. RealClearPolitics' polling average puts the spread at about 7 points. At no point in the last year has RCP had Republicans getting any closer than 3.2 points. It's true that Trump does remain extremely popular among the roughly 24 percent of Americans who are self-described Republicans. But this, too, could hurt Republicans in November. Trump's in-party popularity keeps the GOP's elected officials and candidates for office rallying around the president in multiple ways — mimicking his blatant racism and cruelty, his support for far-right policies (including trade wars and immigration restrictionism), his vicious partisanship, his hostility to the Mueller investigation, his attacks on "fake news" and the press as the "enemy of the people," and even his bizarre fondness for Russia and Vladimir Putin in the face of overwhelming evidence that Putin's government interfered in the 2016 election. These might be acceptable, and even necessary, positions for a Republican to take in 2018. 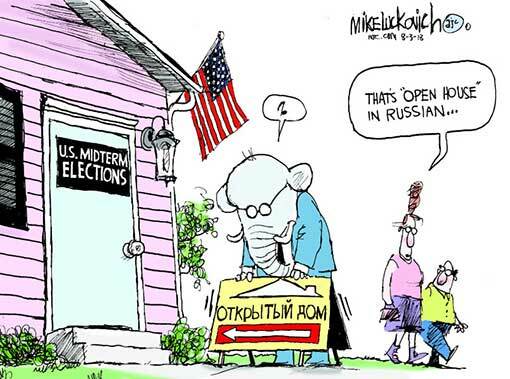 But they're unlikely to endear Republican candidates to independent voters, and they may well be enough to motivate Democrats to show up to vote en masse against the president and his morally compromised party.